It’s an old school exercise book, “190 ruled pages” it says on the front, with “nine-millimeter spacing.” The cover is tattered from age, a faded postbox red bound along its edge with a strip of woven tape. At the cover’s center is a box for the owner to insert name and subject. In hand-printed uppercase letters and blue pen are the words MRS HOLT’S RECIPES. It was my mother’s book. She passed away not long ago. Amidst the painful business of sorting through her life, my father took it down from the shelf above the refrigerator. “I don’t know who else would want it,” he said as he handed it to me. In truth, my mother had nothing to do with its original compilation. As a boy of nine or ten, despairing at the cardboard box stuffed with recipes at the bottom of her pantry, I set about organizing them. With a set of colored pens and my best artistic flourish, I created chapters: casseroles; main dishes; large cakes; small cakes, slices, biscuits and confectionary; soups; and desserts. Each page was carefully numbered. Some recipes I handwrote, adding editorial comment here and there: “this one is good.” Most I stuck to the pages with adhesive tape. Everything found its place and the cardboard box was thrown out. Of course, my mother’s style was never an ordered one. The book today bulges with recipes randomly placed or stuffed. There are casse­roles in the biscuits section and sweet and sour pork in desserts. There are copious recipes scribbled down at someone else’s table, each one a good idea at the time yet never made. The recipes for curried sausages and cod casserole—the ones I thought I’d gotten rid of—had reappeared. Each time I hold the book, cuttings and scraps, even whole pages, fall to the ground. It is everything she was: overflowing, erratic, generous, and all-encompassing. I have nothing else as fragile and nothing as robust. It’s like holding a sacred text. “The keepers of recipes,” food historian Michael Symons writes, “are the makers of culture.” This is so collectively and individually. When I hold my mother’s recipes, I understand better who I am, where I am from and, in part, who I aspire to be. Amidst the pineapple meatballs, the apricot chicken, and the egg and bacon pie with Carnation milk, is part of my story. From the perspective of my spirituality, Mum embodied the ordinary goodness of God for me each day. This tattered old book is testament to her priestly service. In making its recipes, she hunted and gathered on my behalf; she served me and fed me; she connected me rou­tinely with God and those around me. In eating her food I was nourished, enfolded, forgiven, and enriched. The idea that cooking can be a spiritual practice is not a stretch of the imagination; not if you think about it for any length of time. Only one who doesn’t comprehend food’s centrality to our lives—physically, culturally, socially, spiritually—could dismiss it as less. Regardless, as with all spiritual practices, to embrace the act of cooking in this way still requires intention and choice on our part. As any home cook knows, most of what we do in the kitchen is mundane. It’s routine and constant. There are some who view cooking as a grand act of flourish and creativity. Usually such people cook only on special occa­sions when there’s a show to be had and an audience to impress. When it comes time for the dishes, they are nowhere to be seen. But most cooking is not like this. It’s the day-in, day-out business of making dinner. There is no show and no audience, just a few tired people looking as done as the overcooked chops. Each night’s routine is the much the same. The onions are chopped, the potatoes peeled, the carrots and celery diced, and the meat browned. There might be bread to slice, a salad to prepare, or rice to cook. There’s the setting of the table with its plates and knives and forks and glasses, and a jug of water. There’s the eating with its passing and sharing, its talking and its silences, sometimes its laughter or cross words. And then afterwards there’s the clearing away, the washing of dishes, the scrubbing of pans and wiping of benches. It’s done for another night. No doubt, the routines of the kitchen can be drab, but somewhere in all of this is culture at its most raw, its most incremental. The routines may change subtly as life proceeds, yet somehow there is momentum that continues. “The repeated round of cooks is staggering,” Symons says. “Yet this endows human life with rhythm, which gets taken up in ritual, which grows into meaning.” Cooks are the keepers of ritual and the makers of meaning. Ritual is all about meaningful repetition. It’s about repeating those things that help us remember who we are and whose we are. It is so for the cook. It is so for those who eat and for those who wash the dishes and put the water jug back in the fridge. and renewal to our souls. There is something about the preparation of food that ties us with the past. Bob Buford calls it “a conversation between the dead and the living.” And it’s ongoing. It is as though we are surrounded by a great cloud of witnesses in aprons. Together they cheer us on, correct our mis­takes, and remind us that, after all is said and done, it’s just dinner. These ghosts, or spirits as we people of faith call them, are present to us in the recipes we use, the cooking implements we prefer, the ingredients we judge to be non-negotiable, and the events that call us together. I have never made Chicken a la Jean, and I probably never will. But there is something in the spirit of this recipe that hovers over me today. I am a serious cook, more serious and even skilled than my mother was, but I am always conscious of her presence when I cook. “That’ll do!” she would always say. When I am prone to make food more important than people, and to give the processes of preparation more time than I give to those who will eat it, I hear her say, “That’ll do!” In calling to mind those who have gone before us and listening for their voices in our kitchens, we are choosing to make our cooking a continu­ous act of service. Ultimately, it is not just about us. It is not even about our recipes or the locally-sourced ingredients, no matter how trendy or sustainable. It’s about the continuity of love. And in that, it is about God. It was twenty years ago that I first met the late Father Rick Curry. My be­loved and I showed up to a bookshop in Pasadena to hear the one-armed Jesuit speak about his book The Secrets of Jesuit Breadmaking. His un­expected ordination to priesthood was still a decade away. Content to be a Brother, he founded a school in New York City for disabled actors and the Dog Tag Bakery in Washington, D.C. to teach wounded veterans a craft. That evening, before a small and mostly unsuspecting crowd of onlookers, he created and kneaded a simple dough while speaking of his passions for bread, justice, and faith. There is something quite beautiful in this, and a reminder that in the routine tasks and ingredients of the kitchen are the most daily pointers to our dependence, our human need, our frailty, and the connections that sustain us. No matter what else our days hold—whatever is glorious and important, hard and defeating, fleeting and trivial—when we cook we are brought back to life at its most rudimentary. We bow our heads and confess again that all of life is gift. All praise to you, Lord Jesus Christ. 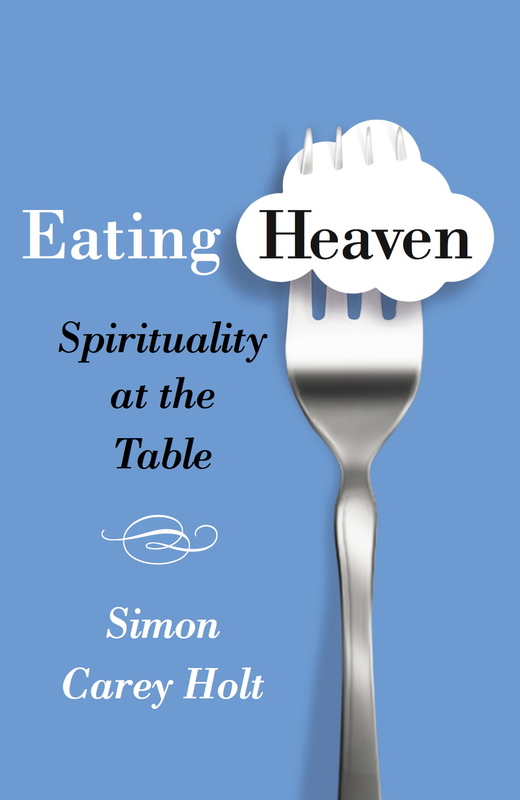 This is an extract from Simon Carey Holt’s new book, Heaven All Around Us: Discovering God in Everyday Life (Cascade Books, 2018). You can order it here, here or here.